I’m a fly-by-the-seat-of-my-pants type of girl. I really love spontaneity. As a result, I’ve thought routines weren’t/aren’t for me. Recently, I’ve come to realize that as spontaneous as I love to be, I’ve been using a morning and evening routine for a long time. I also make use of a To-Do list and a calendar. So although I like to do different things everyday, I have found ‘nonrestrictive ways’ to be productive. I always find it fascinating to see what other people’s schedules look like. So I’ll outline mine in case you do too. Before my kids wake up: If I’m lucky enough to wake up before my kids do I’ll work on my business. First hour of the day that my kids are awake: I change my son and daughter and get them eating breakfast. Then I’ll run upstairs and get ready myself and come finish up breakfast with them. I’ll also really try to sit down with my scriptures to read them (which always kicks off my day on the right foot). Next hour: The kids and I go into our son’s room/play room. We read books together for about 20-30 minutes and then play together with toys for another 20-30 minutes. Then I’ll let them entertain themselves or each other for while so I can check emails and respond to them on my phone. Then, I start on my to-do list until evening. Some things are the same each day (especially nap time & dinner time). On more perfect days I get more done than I have written down, but even on not so great days I still feel good checking tasks off of my do-to list. Often I don’t even put the tasks in order so I can pick and choose at random what I want to do and when. Randomly getting tasks done helps me feel like I’m getting the important things done without too much structure and monotony (which I seriously dislike). 8:00 PM- I start the nightly routine with my kids and put him to bed. Usually after they fall asleep, I will work on my business for an hour and then go to sleep too. Before falling asleep I write a to-do list for the next day. Having a routine from 6-10:30 AM gets me going and gets my to-do list written. Having a routine at night from 8-10 PM keeps me on track and my kids on schedule. Everyday my list is different, which keeps the spontaneity alive, but everyday I’m being productive and writing things down so I don’t forget them. If I don’t get something done, I put it on the next day’s list. Sometimes I even decide last minute to make a new to-do list or throw an extra activity in (like a craft I want to do). I just try to keep life interesting. I’ve also made use of my iPhone’s calendar and notification alarms. It’s hard for me to remember the multiple things I sign up for or agree to. I used to always forget things…and I still would except that I have started to more consistently input events into my phone. I set the alarm to remind me about the time I write my to-do lists. I don’t forget nearly as often. The way I’ve combated feeling like life is too monotonous is by following a few short routines, creating a to-do list each day that is different and unique to what I need to get done, and notifying myself electronically of the different activities and deadlines I have coming up while adding fun activities in at random. It’s worked out really well for me. 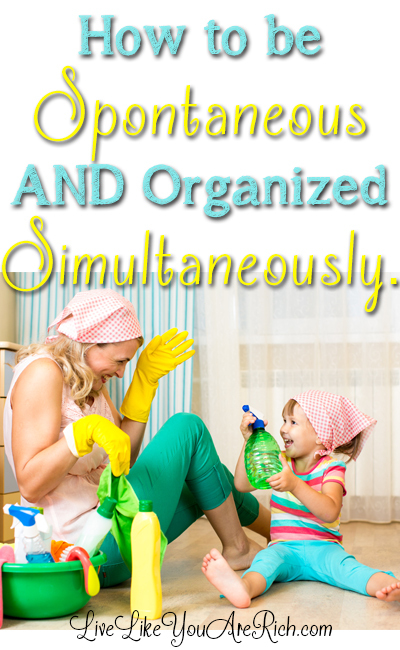 What do you do to keep your life organized? For other ‘living rich’ and inexpensive crafts, please like me on Facebook and follow me on Pinterest. Thanks for sharing! I’ll share mine with you! http://organizewithjulie.blogspot.com/2009/09/how-do-you-schedule-your-week.html It’s on my blog. I use a simple spreadsheet system. IT really keeps me from being overwhelmed! Julie- Great system! thanks for sharing what you do.